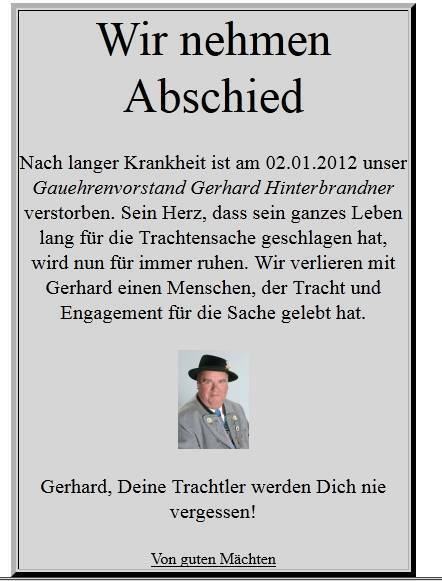 Gerhard Hinterbrandner, Ehrenvorstand of the Altbayerisch-Schwäbisch Gauverband, died today (January 2) in Lechhausen. He and his wife, Marianne, attended the Gaufest here in North America in 1997 in Delaware. Marianne is the current Vorstand of their Gauverband. We join his family and friends in mourning his passing. May he rest in peace. More information can be found in the next few days on the Trachtenverband’s website, www.trachtenverband-bayern.de. Click on "read more" for a short tribute with photo.